What if I told you that there was a form of Hormone Replacement Therapy (Testosterone Therapy) that would take almost no time out of your schedule? Well, there is one: testosterone pellets, the best of class being Testopel. That may not sounds like a big deal, but the fact is that HRT does generally involve a significant time commitment. For example, the blockbuster topical gels, such as Androgel or Testim, require doctor's visits, lab visits (for PSA, liver function, lipids, etc. ), dropping off and picking up of prescriptions, daily application of gels and daily removal of gels just for starters. Injections require a trip to the doctor every two to three weeks, lab work and so on. You go to the doctor and get an "injection" - it's actually more than an injection which we will cover below - and you are done for roughly three months. That's right - no shots every week and no slathering on gel daily. You do have follow up monitoring to make sure that the pellets are still working, but that's it. Plus, pellets deliver a very steady, consistent blood levels of testosterone for months in the sense that there is little day-to-day or week-to-week change. Injections, when done correctly, are weekly but the patient can still end up with fairly large swings (600+ ng/dl in some cases) from the peak to the trough, so the stability of one's T levels is nice. For all these reasons, some argue that testosterone pellets are the most convenient and manageable of the testosterone therapy options with testosterone undecanoate (Nebido) right behind it. So basically his experience was that he went to a peak of about 1200 ng/dl at the one month point and then fell by 250 every month thereafter. Now this is a somewhat typical pattern: basically a slow rise to peak and then a gradual tapering off. And one problem with the pellets is that the doctor does not want to put you on pellets usually until he get you down to about 500 ng/dl. I know I did not really feel that great in the 500's - okay but not great. So that last month can be somewhat of a struggle and 30 days is a long time for most us. During the peak though, it is great. That same poster wrote at the two week point: "--Mental clarity and energy level continue to be noticeable with brain fog minimized. Morning, midday - evening wood noticeable on most days, arousal level increased." I would guess by two weeks, he was in the 800-900 range which is the range when many men start to feel really good. 1. Early Side Effects. The first "generation" of pellets were rife with ugly side effects and scared many doctors and patients away from their use. For example, an earlier study of Organon pellets revealed that 8.5% of patients had extrusions, meaning that one of the pellets actually worked its way up to the skin surface. Another study showed even higher extrusion rates in the 11-12% range. This same study also documented bleeding and infection rates of 9% and 4%, respectively. Ouch! 2. Mood Crashes. Pellets are always given by urologists as far as I know and urologists often do not monitor estradiol. We had one member on the Peak Testosterone Forum that had a VERY strong reaction to pellets, which included severe mood disturbances and depersonalization as he described it. If your testosterone goes over about 900, you more than likely need Arimidex or some other aromatase inhibitor in order to keep your estradiol from going too high. 4. Expense. My understanding is that currently most insurance carriers do not cover pellets for standard hypogonadal (clinically low testosterone) treatment and these pellets, though the size of a grain of rice, are not cheap: about $25-40 apiece with 6-10 pellets being the most common dosage. Reimbursement for the office visit may or may not be possible as well. 5. Sure, You re Stuck. Some men have negative reactions to testosterone therapy, such as elevated blood pressure, depression or anxiety. Some men even have sexual side effects. If you are taking a topical, you stop immediately and it clears out of your system quickly. The same thing with injectables such as cypionate and enanthate. But what are you going to do with pellets? 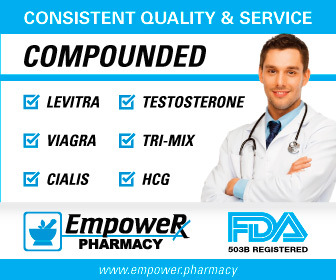 NOTE: Of course, testosterone pellets have all of the common side effects that other HRT options have, including decreased fertility, acne, (possibly) apnea, etc. For more information, see my links on The Safety of HRT and Testosterone Therapy Side Effects. The good news: the technology for pellets has greatly improved and most of the side effects listed in #1 have been greatly reduced with the new Testopel pellets. For example, one recent study showed extrusion and infection rates of only 0.3%, an admirable improvement to say the least. Although the study was sponsored by the manufacturer, I think everyone agrees that these pellets are a significant advance over the prior, being smaller and with more tight quality control for contaminants leading to infection. NEWS FLASH: Golfer Doug Barron used Testopel for his hypogonadism only to find that the PGA labelled him as "doping", i.e. accused him of cheating. However, Doug Barron sued and was eventually granted a PGA Therapeutic Use Exclusion. Doug has almost $3 million in earnings making him one of the top hypogonadal athletes that we know about. This now makes pellets a very convenient option for those who feel they can afford it: nice, steady blood levels of testosterone for months at a time with little additional time commitment. In addition, there are no worries about accidently getting some of the product on the wife and kids, a potential issue with Testim and Androgel, who now have a black box FDA warning requirement. Talk to your doctor if interested of course. 1) Urology Times, Apr 15 2009, 37(5):S8(8), "Long acting testosterone therapy"
2) Clin Endocrinol (Oxf), 1999 Oct, 51(4):469-71, "Extrusion of testosterone pellets: a randomized controlled clinical study"
3) The Journal of Sexual Medicine, Nov 2009, 6(11):3177-3192, "Subcutaneous Testosterone Pellet Implant (Testopel ) Therapy for Men with Testosterone Deficiency Syndrome: A Single-Site Retrospective Safety Analysis"